As those who know me are aware, in addition to opining on visual representations of information, I also cook (and blog about cooking at cole's kitch). I've joked in the past that those sharing the intersection of my personal passions - data visualization and cooking - are likely few in number. But every so often, I am reminded that there are some of them out there. The following is a snapshot of some cool things in this space I've come across recently. As part of her PhD thesis, Lauren Manning documented everything she ate over the course of a two year period. She turned this dataset into 40 visual representations of her food consumption. Crazy, or cool? I vote supercool. In the matrix below, the various visuals are arranged along an x-axis that ranges from straightforward (left) to complex (right) and a y-axis that ranges from literal (top) to abstract (bottom). One thing I'm unsure of is the order in which the food groups appear in the various visuals. It's consistent across most of the visuals, which is helpful, but there isn't a clear meaningful order. If there isn't an intrinsic order in categories, how they are ordered should be an explicit decision on the part of the designer, as it has important implications on what stands out and what gets compared within the visual. The easiest comparisons are those next to each other. So if we were to group all of the starches, for example, it would become immediately clear that the majority were consumed in the form of pasta. Or you could order the categories by food consumption (from greatest to least or vice versa), which would better highlight the relative differences between neighboring categories. One visualization that I didn't see in Lauren's set that I would be tempted to try with this data: spider graphs. National Geographic Magazine recently published an interesting visual showing the relative varieties of different fruit and vegetables a century ago vs. today. In the visual, the width represents the number of varieties of the given food. Above ground are the varieties that existed in 1903; below ground is 1983. The conclusion is a sad one: 93% of the varieties that existed in 1903 have gone extinct. 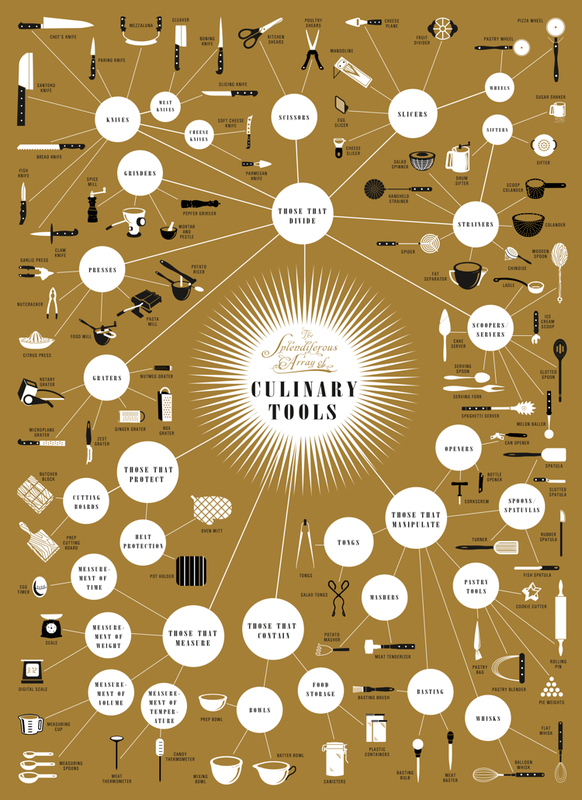 The above poster by Brooklyn-based Pop Chart Lab arranges kitchen apparati into a massive flow chart. The tools are divided into categories according to function (e.g. those that divide, those that protect). I find the "meat manipulation" category a little frightening (looks like a bad mob-murder-tool-kit). But happy to see it's neighboring category, "tongs", which I've been told are perhaps the most important tool in any kitchen. If you happen to come across other interesting food related data visualizations, be sure to send them my way!